NASA’s Juno spacecraft has entered the unknown, penetrating deep into the radiation-filled heart of the Jupiter system in a bold attempt to unlock the secrets of the gas giant’s origins. This ambitious mission could completely reshape our understanding of how the solar system’s largest world came to be – and how it influenced the evolution of other planets. 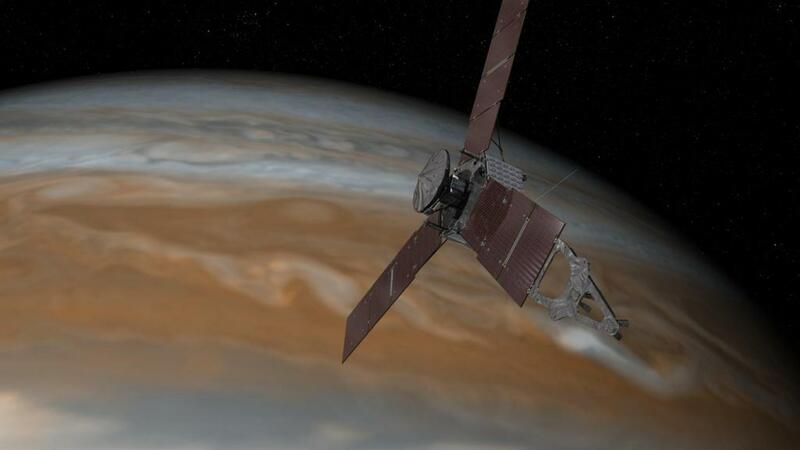 But only if Juno survives the perils of exploring an environment that no spacecraft has dared venture into before. Previously, only the Galileo mission had orbited Jupiter, parachuting a probe into its churning, cloud-filled atmosphere in 1995. Despite its successes, there remain huge gaps in our knowledge of how Jupiter formed and whether it contains a planetary core, a remnant of our early solar system. Indeed, Jupiter’s powerful gravity has forever entrapped the original material from which it formed, making it an enormous time capsule that records the conditions that existed when our solar system was young. The formation of this giant planet played a crucial role in shaping the architecture of the solar system as we see it today. With its immense gravity, Jupiter could have been both our destroyer and our saviour. That’s because its early motion through the young solar system could have destroyed the forming terrestrial worlds, leading to cataclysmic collisions that threatened Earth’s very existence. Later on, Jupiter’s gravity is thought to have shepherded debris such as comets and asteroids that may have delivered the essential ingredients for life to our home planet. The story of Jupiter’s origins is therefore key to understanding our place in the solar system, and the tantalising possibility that similar events unfolded elsewhere. Just like Jupiter’s mythological counterpart, who veiled himself in clouds to hide his mischief, the giant planet will not give up its secrets easily. Juno’s suite of sophisticated instruments must probe deeper than ever before, to regions beneath the churning cloud decks that are invisible to our Earth-bound telescopes. After a five-year journey, the solar-powered spacecraft will embark on a series of fortnightly orbits around the planet, taking it high above the planet’s poles and then skimming within 5,000 kilometres of the cloud tops. These close passes will permit precise measurements of Jupiter’s gravity and magnetic fields, probing its inner structure and its density. This will help examine the exotic interior of the gas giant, where simple hydrogen gas is compressed under immense, crushing pressures to become metallic and conducting (a state only glimpsed fleetingly in laboratories on Earth). These measurements could potentially provide the first glimpses of a core, if one exists at all. If our theories of planetary formation are correct, then Jupiter’s heavier elements, such as carbon, nitrogen and sulphur, should have been delivered as molecules trapped in water ice cages, frozen in the cold outer reaches of our young solar system. That should have left behind a huge amount of water in Jupiter, but as water condenses in the frigid conditions of the planet’s atmosphere, we have never had a reliable estimate of how much is really down there. If there isn’t enough water present, then the prevailing theory of Jupiter’s formation would have to undergo a complete revision. In the coming months, Juno will answer this question. It carries an instrument that can map Jupiter at microwave wavelengths, allowing it to reveal the distribution of water deep below the clouds for the first time. Combined with the gravity measurements, Juno will peel back the layers of Jupiter to finally test our theories of how giant planets form – is a heavy planetary embryo required, or can these enormous worlds form directly from the collapse of the gases surrounding a young star? Juno’s unique orbit will also provide our first direct views of Jupiter’s poles, exploring the powerful auroras and dynamic atmosphere. The spinning spacecraft (three rotations per minute) will sweep the array of sensors through the radiation environment to explore the immense plasma and magnetic fields. Its camera will target atmospheric features, such as erupting storms and spinning vortices, at breathtaking resolutions. In addition to the scientific instruments, Juno also carries the first Jupiter camera to be aimed primarily at education and outreach, with the public invited to suggest the targets. To add to this intense scrutiny, an army of professional and amateur observers, including those here at the University of Leicester, are engaged in an international campaign to support the mission. These observations will provide global views of the planet to support Juno’s up-close observations; reveal how Jupiter’s dynamic atmosphere changes throughout the mission, and observe it in wavelengths of light that Juno cannot access. An example of the incredible capabilities of Earth-based observers is shown by our recent images from the Very Large Telescope in Chile. But during all of these unique observations, the intrepid Juno spacecraft will be taking a pummelling from the high-energy particles within Jupiter’s harsh radiation belts, equivalent to 100m dental X-rays in the first year alone. No spacecraft has ever had to cope with such severe conditions. Even with the instrument components shielded in a vault with 1cm thick titanium walls, there will still be an accumulation of radiation damage and a degradation of equipment. No one knows exactly how the instruments will fare as the long-suffering spacecraft heroically battles on to complete its 20-month mission. But one thing is certain – Jupiter’s cloak of clouds will no longer shroud its mischief, as Juno’s instruments gaze down into the heart of the giant for the first time.